An analyst scare in Chipotle Mexican Grill, Inc. (NYSE:CMG) looked like another health crisis during Thursday’s session in CMG stock. But the big picture suggests no harm, no foul and a nice opportunity for bullish traders ordering off the short-term options menu in front of next week’s earnings event. Let me explain. Chipotle’s long-running intestinal issues continued to rear their ugly head Thursday. The good news is the questionable damage was contained to the CMG stock chart and not another ugly problem inside one its franchises. Shares of CMG were down as much as 5% intraday before closing off a slightly less unsettling 3.09% after a downward revision from “neutral” to “sell” by UBS. The firm cited a worrisome trend in online customer reviews still hitting all-time-lows and how the negativity could impact sales and earnings growth. Aside from the obvious brand perception challenges tied to the survey, UBS also cautioned of increased competition within a difficult restaurant environment, store cannibalization and how potential sales drivers like Chipotle’s recently introduced queso sauce have failed to be embraced by customers. Bottom line, next Tuesday night Chipotle delivers its Q4 earnings and investors will find out if UBS’ bold sell recommendation and rationale, proves presciently on the right side of things or not. For now, most others in the Wall Street community still overwhelmingly view CMG stock as a hold. 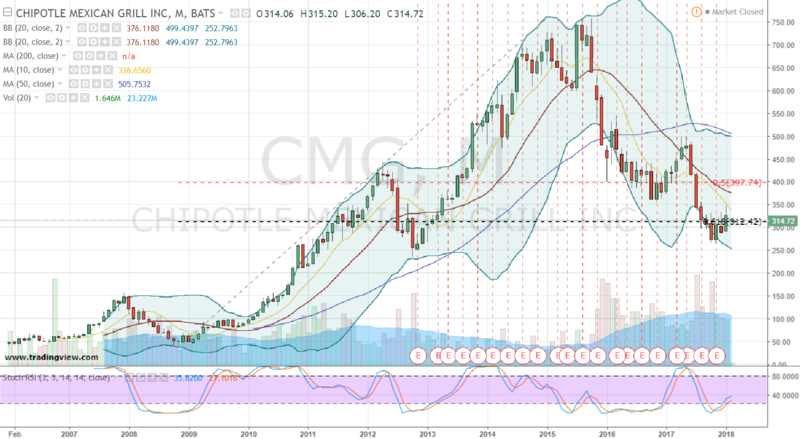 Yet from my possibly obscured and optimistic perch in Portlandia where the lines still run deep inside Chipotle and where the price chart still looks like a tasty value; CMG stock remains a buy. Similar to Thursday’s daily price action as CMG stock pierced its 50-day simple moving average before reversing back through the well-watched technical level; the big picture hints that bears could be overstaying their welcome. The extended monthly chart shows after a couple years of nauseating corrective activity, shares of Chipotle appear to have bottomed. Not unlike Thursday’s piercing and bullish closing pattern, the monthly price action in CMG penetrated then reversed back above the 62% Fibonacci support level based on CMG stock’s all-time-low to all-time-high cycle late last year and continues to hold. Together, the technical takeaway is Thursday’s pullback, while aggressive, did finish technically strong and supports the idea CMG’s monthly bottoming pattern and developing uptrend of three months are just the start of a longer-term rally for CMG stock. For shorter-term traders wanting to position into next week’s earnings event, I like the idea of approaching CMG stock using an out-of-the-money bull call spread. Verticals like this go a long ways towards minimizing and containing risk in the event we’re wrong. The downside here is both timing and direction both need to cooperate. After reviewing Chipotle’s options, one combination of interest is the February $335 / $350 call vertical. With shares at $314.72 the spread is priced for $3.50 or just over 1% of the risk associated with holding CMG stock. I chose this particular design for a couple reasons. For one, as a volatile stock and known for making large earnings moves, the low dollar cost and risk is attractive. This type of spread is also easy to adjust or even take quick profits if there’s a bit of pre-earnings support in CMG stock. The vertical is also appealing as intrinsic profits quickly begin to build if the bulk of CMG stock’s resistance up to the $335 area is cleared by expiration. Also, while this is a short-term position the trader does have eight trading sessions after the report to allow, hopefully, for upside follow-through in shares. Lastly, should the narrowest of new highs within CMG’s uptrend be confirmed above $350, the payoff at expiration amounts to a very nice profit of $14. And while I also wouldn’t be inclined to buy any queso with the proceeds, another healthier option like Chipotle’s veggie bowl would certainly be on the table. Investment accounts under Christopher Tyler’s management currently own positions in Chipotle stock (CMG) and/or its derivatives. The information offered is based upon Christopher Tyler’s observations and strictly intended for educational purposes only; the use of which is the responsibility of the individual. For additional market insights and related musings, follow Chris on Twitter @Options_CAT and StockTwits. 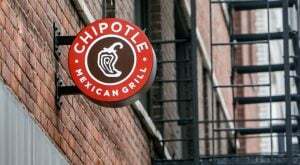 Article printed from InvestorPlace Media, https://investorplace.com/2018/02/chipotle-mexican-grill-inc-a-deliciously-bullish-options-order-in-cmg-stock/.